Intel goes Atom crazy - but where are the phones? The second day at the Intel Developer Forum (IDF) in San Francisco has been all about Atom, the littlest of PC processors but a very big deal for Intel. Atom is the key to getting Intel into new lucrative markets. 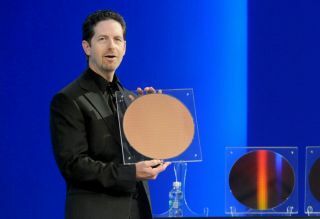 The world's biggest chip company duly rolled out a slew of Atom-related product announcements and industrial alliances aimed at doing just that. However, arguably the biggest coup of all never materialised. There's still no hard evidence of an Atom-powered smartphone on the horizon. Still, today it was the job of Intel's Doug Davis to dish details on Atom. Davis unveiled new Atom chips aimed at a wide variety of markets and form factors including tablet PCs, HDTVs and even cars. Put simply, Intel wants its chips powering anything and everything that connects to the internet. Our whistle stop tour of the new chips starts with the CE 4200, a full-on system-on-a-chip design targeted at internet-enabled HDTVs or as Intel would rather they be known, smart TVs. The key upgrade for the CE 4200 over the existing CE 4100 is the addition of a hardware H.264 video encoder. This should allow for various funky new real-time usage scenarios. Think multiple streams, picture-in-picture, piping content between devices and more. The CE 4200 should find its way into various set top boxes and HDTV sets in 2011. To prove its prowess in the TV market, Intel rolled out long-time bedfellow Microsoft. The Beast of Redmond has been working on a new take on its Media Center tech. The new set top device runs Intel Atom and Windows 7 Embedded to deliver what was described as the full HD Media Centre experience on the cheap. Acer and Asus are said to be working on retail versions for 2011. Intel also announced a new set top device from D-Link and Boxy as well as a new Linux based media centre interface from Amino. Next up is the Atom derivative formerly known as Lincroft. We've already seen quite a bit of Lincroft branded as the Atom Z600 and part of the smartphone-targeted Moorestown platform. New for this IDF is a derivative known as Oak Trail. The big noise here is the addition on a new daughter chip which provides PCI Express among other functionality. That in turn means support for full house operating systems such as Windows 7. In short, Oak Trail is meant to be the killer chip for tablet devices and uber thin and light netbook systems. Of the myriad of Oak Trail-powered devices on stage, the show stealer was undoubtedly Dell's new Inspiron Duo. At first it looks like a chunky 10-inch tablet, only for it to split down the middle and reveal a hidden keyboard and swivelling screen mechanism. The Inspiron Duo's hardware looks pretty hot. Unfortunately, the device was noticeably laggy and unresponsive during the on-stage demo. Still, given that Oak Trail is all about reduced power consumption rather than increased performance, that's hardly surprising. Atom-powered systems running Windows 7 have always been pretty ghastly. The last of our Atom chips is the new E600. Designed for embedded applications, the E600 is a chip that will very likely be invisible to end users. However, Intel is hoping it will be powering the infotainment system in your next car. Put all these new Atom chips together and you have a strategy for getting Intel into almost every imaginable internet-connected device, except those pesky smartphones. We've shot the breeze on numerous occasions with Intel representatives regarding phones. As for the absence of Atom-powered phones at IDF, Intel's Alistair Kemp rightly points out that smartphone product development cycles are more drawn out and complex than PCs or tablets. The phones, TechRadar is assured, are coming.